One thing it seems our property suffers from is a distinct lack of diversity in trees. Everywhere we look we see spruce, balsam, tamarack and pine, with the occasional birch or poplar thrown in for a tiny splash of "colour". We would very much like to see a bit more variety if possible. At the same time, we also would like to someday see our property begin to produce more food for us to enjoy. With those things in mind, we decided this spring to see if we could get some apple trees to survive down where the pond had been dredged out. Apple trees like acidic, well drained soil, and that spot seemed to fit the bill fairly well. Grandpa and I had worked some compost into that area almost two years ago, so it was probably the best area on the property to have a chance at supporting something different. We headed down to Vanderwees Garden Centre and looked through their selection. Of course, the pricing was higher than we would have liked, but they did have two different species that were hardy to zone 2. A Norkent and a Kerr. We picked the most vigorous examples of both, along with some specialized additives to help trees to thrive. While there we also grabbed a couple of vegetables to experiment with my container gardening concept. Back home I did a bit of research into how to plant these trees before I commenced with digging their holes. Grandpa dropped by and we went outside to start on the process. Mummu arrived shortly after to size up the situation, but both her and Grandpa headed home before we actually got the trees settled in. Kenny and I tried to dig out the holes fairly larger than the root ball. I removed all the rocks and roots I encountered, and then poured in some fresh soil, along with the other "Myke" supplement. I carefully and gently set the trees in place, and then mounded up more of our purchased soil around the outside of the root ball. 20L of soil? No problem! Making sure she's settled in. Finally I smoothed out the area around each tree, trying to keep a small depression near the trees and then soaked the ground around them with our watering can. Making sure they aren't thirsty during their first night in a new home. Now all we can do is hope for the best! I'll be sure to post when we see anything significant. 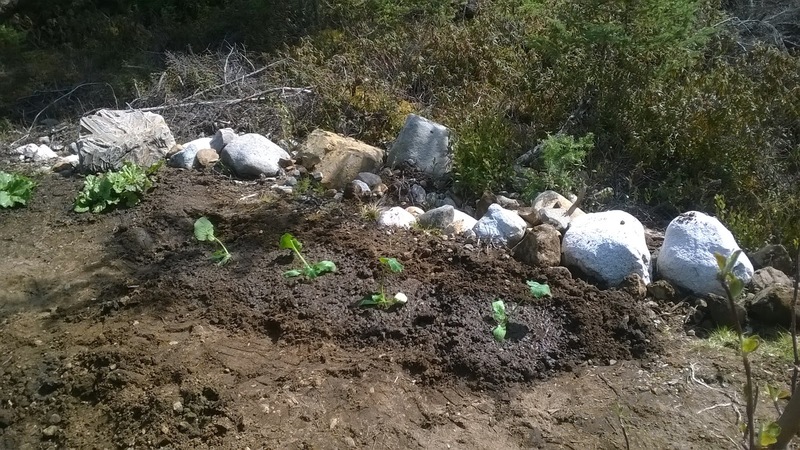 In the meantime, I've also planted up a number of our containers, and we'll see how well that experiment works out. Donna went beyond helping with the trees and containers by planting a few of the extra zucchinis along the edge of our new "orchard". Interesting to see where these guys go. Donna headed off to town clothes shopping last week. She was interviewing for a job and felt that she needed a new outfit to look professional. Of course, Kenny and I think she looks beautiful no matter what she wears. While she was gone, Kenny and I reverted back to our old ways from Kitchener. I gave him some free time, then a quick lesson (some geometry - find the centre of a circle, bisecting an angle, etc.) Then we did a "zone clean". I found that it was easiest to keep the house in order by dividing it into sensible "zones". Each room is usually a zone, same with hallways and such. Anyway, we began with the master bedroom, which while clean, was certainly cluttered. I removed everything that made sense, and then did the floors. 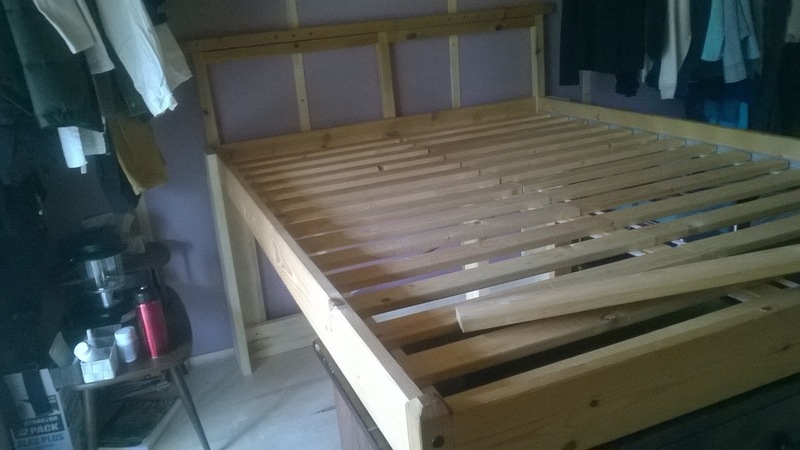 While I had everything out, I decided that we should try to do a temporary mock-up of an idea we had floated for some time - raising the bed so that there was more storage beneath it. I put some sawhorses under the head, and then slid the dresser under the feet. 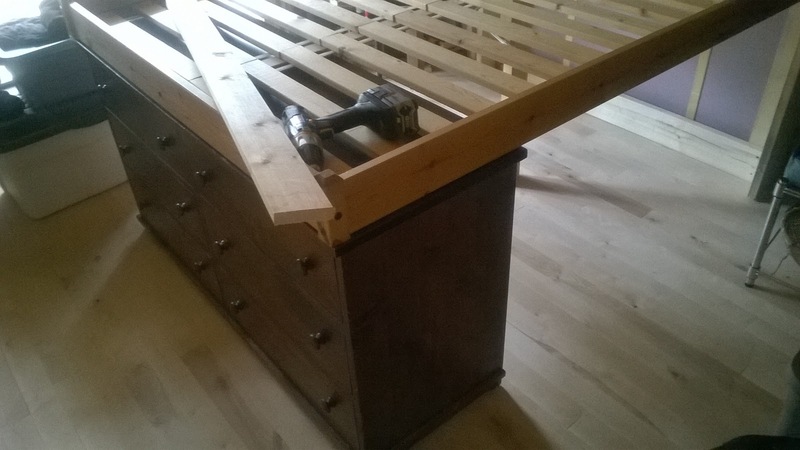 Then I cut off the existing legs of the bed so that it could rest perfectly on the dresser. Got the old legs off - now to add a brace. 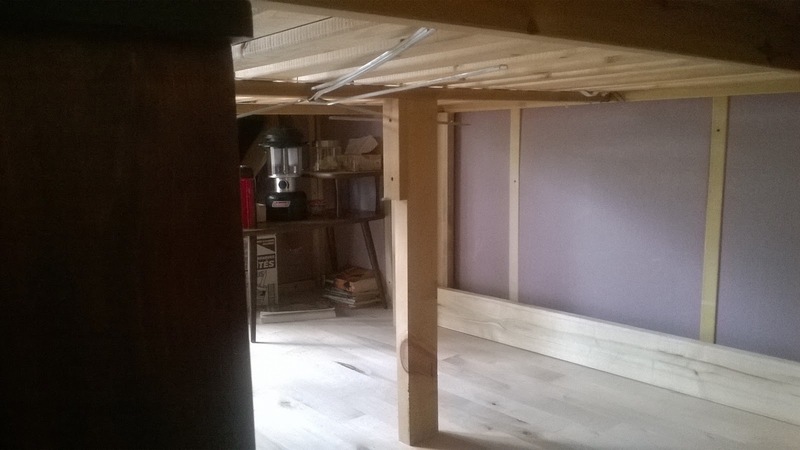 Next I built some replacement legs out of pairs of two by six poplar boards left from the sauna renovations. Bit better view of one side. And a support post under the centre. 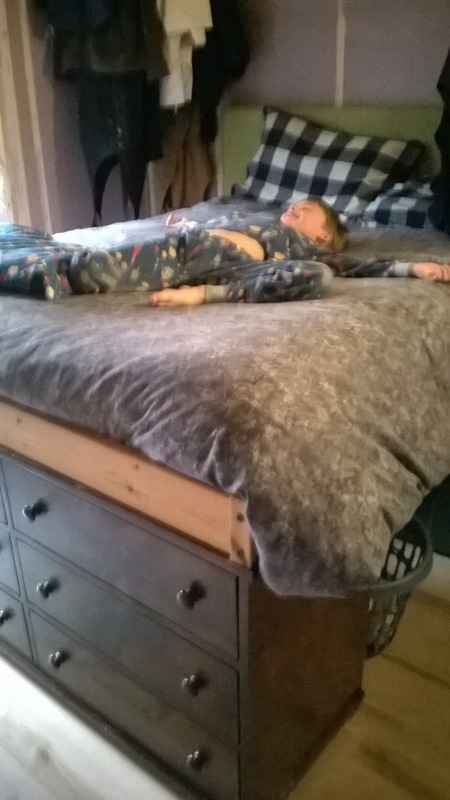 When I was satisfied that they were stable enough, I replaced the mattress and sheets, stored a few items underneath, and reorganized my clothes rack so it lay parallel to the bed, instead of perpendicular to it. This way the clothes weren't hanging in my face. It was high. Very high. It is slightly more than a metre (yes, more than a yard!) to the top of the mattress. This means we need a step stool at the very least to get in and out of the bed. It has much more storage underneath. I am thinking that I will probably put some shelves or something under my side to store off season clothes and personal items. On Donna's side we discussed last night that she could even put in a small rolling desk for doing her professional work. It is far easier to make the bed. Having it up at sternum height means no more bending over to tuck sheets in or fluff pillows or any of that stuff. I am guessing that it will be at least marginally warmer. I have repeatedly heard that this is why royal beds always appear so high, and why people use ottomans to raise their feet off the floor. 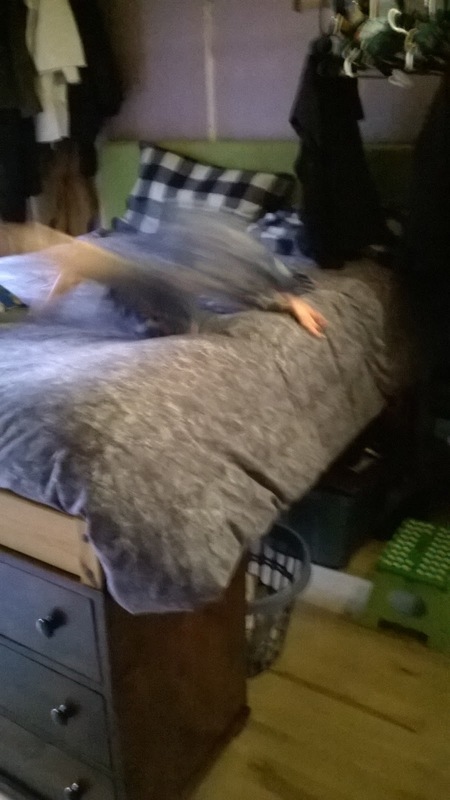 Higher stakes if you fall off the bed. Hopefully we won't have to worry about this. I was concerned the first few nights if one of us forgot while getting out of bed in the dark to go to the bathroom, but we've adapted right away. All things considered, Donna says she is really happy with the height. 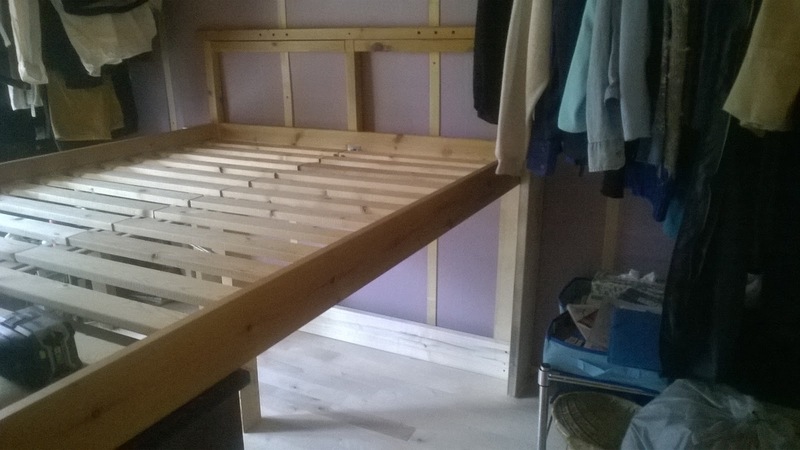 I am thinking that perhaps what would be best would be to build up a one or two step platform on each side of the bed to ease getting in and out in the long term. Kenny was nervous at first, but now he doesn't hesitate to go mountain climbing into our bed whenever the mood strikes him. Just a blur of activity! Now holding still long enough for a picture.